I know its been a long time coming. So here it is, whew! I went hiking for the first time in my life, and this was huge for me. Firstly, I’m so sacred of heights! My first airborne transport journey wasn’t any easy, (I’ll share that later) so it happens with heights. I literally prayed to God for this one, for help, in my widest dream never thought I’ll ever go hiking but I did thanjs to my college friends! I left out a silent gaseous release from my bowels, I perceived it and it didn’t disappoint me, so I knew it won’t embarrass me. You have paid the 1k, I said to myself don’t let it waste o, after all they said you can stay at the entrance of the mountain so don’t worry. I smiled to that affirmation, not knowing what lay ahead. “Are you for the hiking?”, a man asked when we approached our destination. I noticed my water poured on Portia’s car mat, kai, maybe this is a sign, take your things and go back home, but I couldnt retire in defeat. I had come and I was going to see the end of it all. We got to the feet of the mountain and as I looked up I knew I was definitely making a wrong bold move. I swallowed my fear and followed. A mountain climber had come down to help us up, and I was thankful because Portia had gone ahead of me I couldn’t even see her break light, how could she be so fast and betraying! To have left me all by myself. I beckoned to tge other ladies who had come minutes after us and I got a very polite “agba”, they didn’t want to yab me at the same time they did, I’m sure they’d be like – see this girl o, me that I have not finished holding myself I would now add your fat body to mine! I got to a point where the mountain climber left me with some hot dudes! Not just one or two but three heavy macho black niggas worthy of being a companion. In my heart there was this leap of joy…. I weighed them with my eyes just incase I fall, let me be sure they can deliver; 6 packs fit check, strong check, energetic check, willing to help check; okay that settles it! I told myself I wouldn’t move an inch from their sight, no way! They really helped me a lot, especially this one dude – he was so helpful ehn that I wanted to give him a big warm hug after jumping and telling him to carry me all the way 😂😂😂. Nonsense girl!!! My eyes started rilling and my tummy started acting funny, this was the time I knew I might embarrass myself. I held onto a stick as I was told it helped and tries to puke but it was fruitless, thank heavens. The guys broke out into a conversation, apparently they were connected somehow, and they talked well enough for me to forget my fears then I joined in about my university but that was it, I couldn’t go further as I was reminded of my fears. We reached a certain height where I thought was our final destination because I saw two fat ladies taking a selfie. I was excited, so I asked and my fears were once again reconfirmed – the mountain top was still up ahead. I felt helpless…. I just allowed myself to be helped, I wasn’t gonna do any feminist thing here, I’m strong yes, bold yes, fierce erm yes, not too fierce though but on this mountain these dudes gotta help me out. 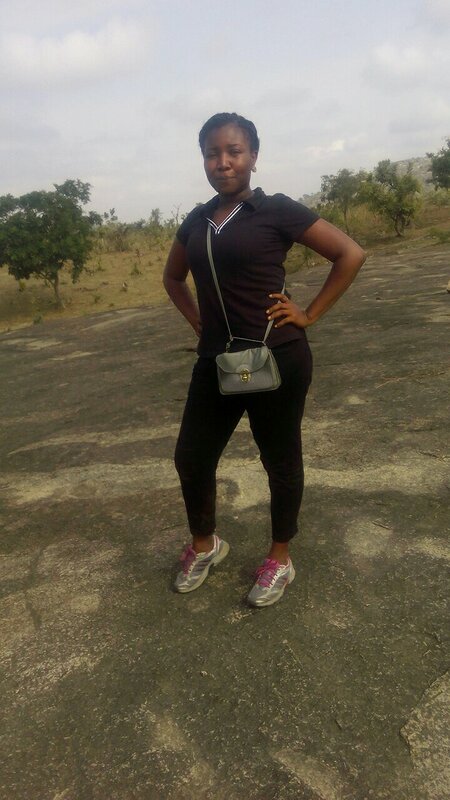 As we approached the top, I saw my people – the ladies i was supposed to start this journey with, I saw Portia teaching yoga, aah Portia you left me abi? She’s like what is she supposed to do. I’m like how did you even move so fast……. I looked back in shock – you say? Like I just reached here, I’ve not even taking a selfie not to talk of a picture. At this point I had left tue dudes that saved my arse and ran over to gist with the girls, kai, I need to go back to them o because I’ve been told that coming down is more intense that going up…. And so we started down, and you know I was the “second to the last” lady that made it down, if that’s any consolation! I almost fell! I looked up from the top, my fears won’t let me appreciate the sight but it was beautiful…. It was a fun experience I would never forget because it taught me a lot about approaching the fears and conquering them. So would I like to go hiking again? You already know! My next fun adventure task would be to ride on a power bike…. My help during the climb has one, I might just volunteer for a tour!